It might actually be said that Australia is Malaysia’s closest military cooperation partner. The close defence relationship between our countries is one that has come about due to various factors, including the common security umbrella of the Five Powers Defence Arrangement (FPDA) and a long legacy of Australian presence and sacrifice on Malaysian soil, in both World War II and the communist emergency. And we can add to that the long period of bilateral military training, exercises and cooperation that the two countries have had. 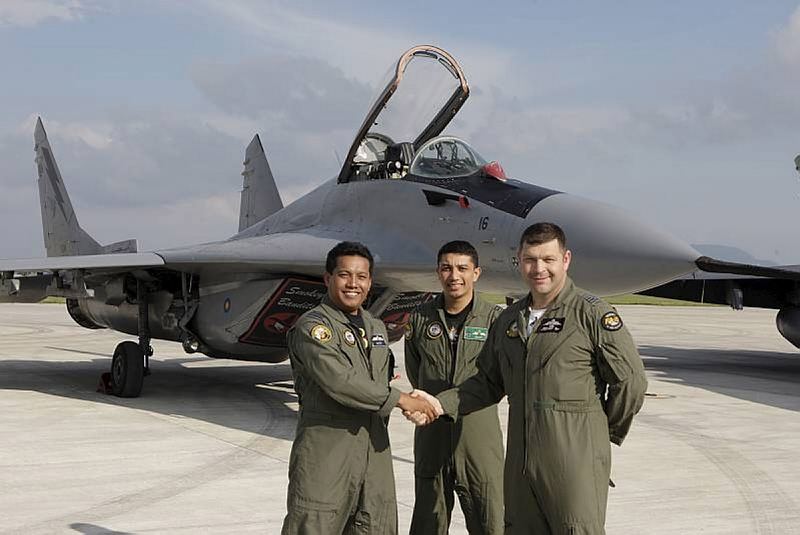 Australian military officers have long been serving in various training capacities in Malaysia and as such have built close relations with the Malaysian officers they have trained. In 1989, the current Australian Chief of Defence Force, General David Hurley, served a posting as the Mechanised Infantry Adviser, Australian Army Project Team Malaysia. Among the Malaysian Army officers he worked closely with while in Malaysia was the current Malaysian Chief of Defence Force, General Tan Sri Zulkifeli Mohd Zin. As well, numerous Malaysian officers have undergone initial and advanced training and education in Australia, and, at the same time, Australian officers have been regular fixtures in student classes of the Malaysian Staff College. Similar exchanges and training have been carried out for NCOs and enlisted ranks. All this has fostered a strong personal tie and bond between the militaries of both countries. Australia is one of very few countries (the other being France) which actually has an officer working inside the Malaysian Ministry of Defence (to oversee the operations of the Malaysian Australian Joint Defence Program). Such was the closeness of the ties between the two countries that when Malaysia was preparing to deploy its team in Afghanistan via C-130s of the Royal Malaysian Air Force last year, the Royal Australian Air Force provided the free use of its C-130 mission training simulators in Australia as part of the RMAF pilots’ training. While the RMAF had a C-130 simulator, there was no mission module which replicated expected conditions in Afghanistan. However, despite the closeness of the ties between the two countries in the military sphere, there remains a limit as to how far it can be taken due to several factors, some of which have the potential to impact upon existing cooperation between the Malaysian and Australian militaries. One such factor is perhaps the difference in the way the two countries see the application or participation on their military forces on the global stage. Fundamentally, the Australian military has always been structured as an expeditionary and interventionist military force and, from a Malaysian perspective, political decision making to commit the Australian military overseas has been guided in some ways by idealism and moral principles. Conversely, the Malaysian military is a largely territorial and peacekeeping military force with the decision to commit overseas based on a realpolitik estimate of the economic and political value of such to Malaysia. The result is that there is a limit as to how far both countries want to commit towards joint training. Apart from the FPDA, regional peacekeeping deployments like Cambodia and East Timor and HADR operations, these fundamental differences mean that the joint deployment and/or cooperation between Malaysian and Australian military forces in a coalition seems highly unlikely. It should be noted that in two global areas of operations where both Australia and Malaysia are present—namely, the Gulf of Aden and Afghanistan—neither countries’ military forces deployed there are cooperating on a close basis or are integrated operationally. In Gulf of Aden naval operations, Australia has been operating under the mandate of CTF-151, a multinational task force established for counterpiracy operations. Malaysia in turn opted for a narrow, national mission of escorting ships belonging to Malaysian shipping company (MISC), while rendering assistance where possible to any vessel facing pirate attacks in the vicinity of the RMN ships operating there. In Afghanistan, while both countries operate under the ISAF mandate, the very nature of Australia’s combat oriented mission in a contested sector means that there is no possibility of the 40 plus Malaysian military medical team being stationed with the Australian military, despite the ties and cooperation between the two. Instead, Malaysia deployed alongside the New Zealand PRT in what was then perceived to be a quiet sector of Bamiyan province. So it might not be surprising if neither country wants to deepen the relationship. The factors at work in these two deployments reflect differing outlooks on global military commitments. In fact, the current strong Malaysian–Australian relations may actually limit future cooperation. Given that military cooperation today often functions as an aid to diplomacy and diplomatic ties between countries, military cooperation with Malaysia may be overridden by the priority for Australia to pursue military cooperation with countries that Australia has a historically more difficult relationship with, such as Indonesia. In my next post I’ll examine some other issues in the Australia–Malaysia defence relationship, such as the asymmetry of the defence budgets of the two countries, and their very different views of national security. Dzirhan Mahadzir is a defence journalist, Malaysia correspondent for Janes Defence Weekly and former guest lecturer on military history and strategy, Malaysian Armed Forces Defence College. Image courtesy of the Department of Defence .